The severe national recession has turned economic growth and development into pressing concerns. Economic growth typically means increased real output of goods and services, and development usually refers to improved standards of living and quality of life. To many people, the most important aspect of both is the creation of jobs. In the state of Michigan, the quasi-public, quasi-private Michigan Economic Development Corp. has been variously charged with "developing strategies and providing services to create and retain good jobs and a high quality of life" and "transform[ing] the economy of our state ... [b]y executing the Governor's economic development strategy. ..." The first of these quotes was from the mission statement of the MEDC during the Engler administration, and the latter was from the mission statement of the same department during the Granholm administration. Setting ambitious goals for the MEDC has been a bipartisan effort. The MEDC is unlike most state agencies. It is a separate corporation receiving tax monies along with some independent private revenue, and it is headed by an executive board of political appointees. This unusual status, along with the corporation's lofty goals, renders it interesting. 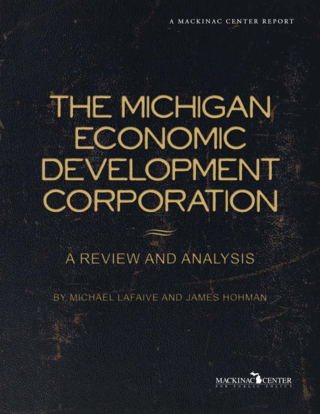 In the following pages, we describe the organization of the MEDC, enumerate its many programs and review the performance of several of them — particularly the Michigan Economic Growth Authority, the MEDC's flagship program — in an attempt to assess the corporation's performance and gauge the likelihood of its achieving its economic development goals. This aim is particularly important given that the MEDC has become less transparent about its operations and activities in recent years, a development we discuss at some length. Michigan Economic Development Corp., "Account Manager Services," undated brochure. Michigan Economic Development Corp., "Transformation: A Strategic Plan for Michigan's Economy 2007-2010," http://ref.themedc.org/cm/attach/1EA139A5-77D6-47E1-ADBB-A4ABA5F7D73A/Strategic%20Plan.pdf (accessed July 30, 2009).